Since 1968, Gatherall Bindery of Wixom, Michigan has been serving southeast Michigan’s small and mid-sized businesses with quality binding of print from more than 200 regional, small and commercial printing plants. Much of that work today is digital in nature, with short print runs and fast turnaround expectations. Mark Culley and Brian Johnson lead the business, and noted that some of the greatest challenges a bindery faces today are keeping pace with the fast-turn workflow and managing the array of paper and substrates that come through the door. That’s why the decisions they make regarding binding and finishing equipment are so critical. “As far as bindery goes, the equipment is our business,” Culley said. Working with local dealer Mid-State Litho of Flint, Michigan, the company has built an impressive, coordinated workflow based predominantly on equipment supplied by Standard Finishing Systems. In fact, the company has a more than 20-year relationship with Standard Horizon technologies. Today, Culley and Johnson field questions from colleagues all the time about equipment dilemmas, and inevitably they’ll suggest, “Just buy the Standard Horizon. You’re not getting a tinker toy. You’re getting a machine that’s going to last,” Culley said. Among the Standard Horizon investments Gatherall has made are: a BQ-270 Perfect Binder; an SPF-200L Bookletmakerwith VAC collating towers; a StitchLiner 5500 Saddlestitcher with four VAC collating towers installed in 2006; and the newest installation, a BQ-470 Perfect Binder with PUR adhesive. The StitchLiner 5500 has been a workhorse. “It’s used 10 hours a day, five days a week, and it has allowed us to create thicker books that we weren’t able to do before,” Johnson said. “For example, I was just able to quote a 120-page self-cover saddlestitched book, and in the past, because of the page count, that may have been sent out to another bindery. Now, we can do that with confidence and quickly,” Culley explained. The most significant “game changer” investment came in the form of the Standard Horizon BQ-470, according to Johnson and Culley. “It has opened up a whole new market,” Culley said. The same could be said for the SPF-200L Bookletmaker, which enabled the bindery to produce landscape-oriented publications. But it’s the BQ-470 with the PUR adhesive that was truly transformative. “Because we receive jobs from so many printers, and are asked to perfect bind books with all different weights and grades of paper, we were finding that EVA glue wasn’t always the best option,” Culley recalled. “We didn’t want to turn jobs away, and there was a period when we lacked confidence that the binding would hold up over time. The BQ-470 with PUR glue gave us that confidence, as well as the quality, speed, and consistency we needed. It was a game changer and problem solver,” he added. 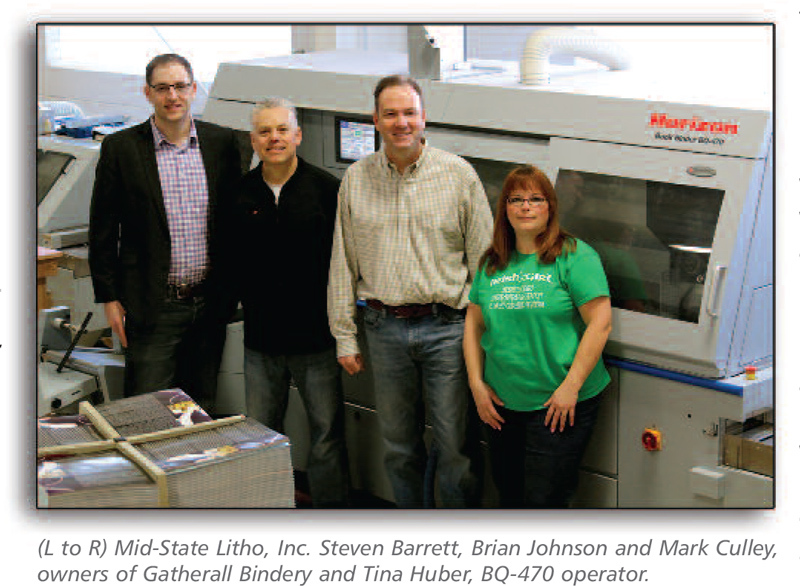 The team at Gatherall Bindery applauds their representatives at Mid-State Litho and at Standard Finishing Systems, who they noted are unwaveringly knowledgeable, responsive, and trustworthy. This entry was posted in Testimonials and tagged BQ-470, FinishLine, Game Changers, Gatherall Bindery, Horizon, Standard on December 28, 2016 by Billi Jean Johnstone.